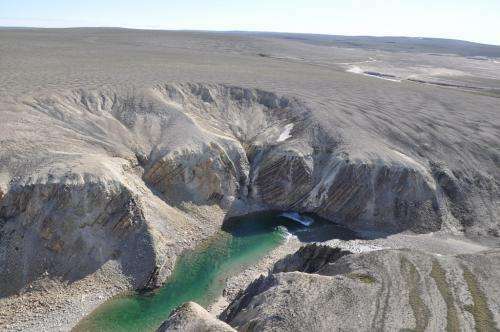 (Phys.org) -- Researchers from the University of Saskatchewan and the Geological Survey of Canada (GSC) have discovered a massive meteor impact from millions of years ago in Canadas western Arctic. Located on the northwestern part of Victoria Island, the impact crater, or astrobleme, is about 25 km wide and is Canadas 30th known meteorite impact feature. The researchers discovered the crater two summers ago while exploring the area by helicopter for the Natural Resources Canada (NRCan) Geo-Mapping for Energy and Minerals program, and it took two years to properly assemble the geological maps and submit their article for publication. Pratt and Dewing named the new discovery the Prince Albert impact crater after the peninsula where it is situated. And while there is no way to pinpoint the exact timing of the impact, evidence suggests the crater is younger than about 350 million years but older than about 130 million years. One of the questions asked of Pratt is how could something this large lay undiscovered for so long. There are at least 160 known meteorite impact features on Earth. Because of the extent of ocean coverage, the effects of weathering and erosion, and the dynamic nature of plate tectonics, Pratt said geologists believe many more meteorites must have hit the Earth but there is now no trace of them.